Going to school can be difficult with the burden of high tuition costs, long work hours and an endless amount of homework assignments. 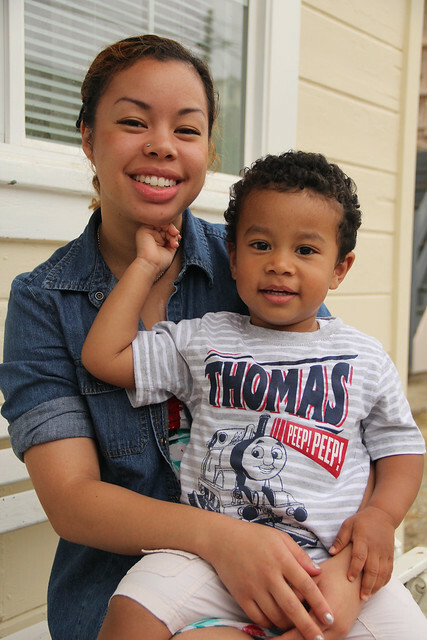 While most students struggle to carry the heavy load associated with going to school, SF State student Khay Hembrador takes it in stride while holding her 2-year-old. Hembrador, 23, sets her eyes toward graduating in the spring with a degree in Asian American studies; however the situation is proving to be difficult. She works three different jobs and does her homework while her son Kairese constantly craves her attention. Hembrador stays with her parents during the semester and, although they help out when they can, she has to drop off Kairese with the babysitter during the week. A typical day starts when she wakes up at 7 a.m. and drops off Kairese at the babysitter. She arrives to work at the Asian American Women Artist Association by 9 a.m., then when she’s off at 3:30 p.m. she heads to SF State to make it to class by 4 p.m. Weekends are no time for leisure; some days she has to work 12-hour shifts. Monday and Friday she teaches a karate class at Karate Team USA while her little one watches off to the side. Hembrador’s karate instructor Andrew Rodriguez has known her for almost three years and admires how hard she works at keeping multiple jobs and going to school, still making time for her son. Before Hembrador became pregnant with Kairese, she was trapped in an abusive relationship that resulted in a miscarriage. Her parents saw her second pregnancy as a tragedy, but Hembrador saw it as her drive to succeed. Now that she has broken away from the abusive relationship and has full custody of Kairese she can concentrate on creating a better life for the both of them. One of her biggest struggles is finding an affordable place for child care. She currently pays her babysitter $800 a month, but hopes she will be able to get into free childcare at the Early Childhood Education Center located on campus. ECEC Director Sarah Johnson said the center takes in about 81 student parents each semester, with undergraduate low-income families receiving first priority. There are more than 150 families currently on the waiting list. While she waits, Hermbrador focuses on other ways to get by. Hembrador said whenever she gets to spend time with Kairese outside at the park or at Chuck E. Cheese’s the goal is to get him tired because she can’t do her homework while he’s awake. She either has to leave the house to do it or wait until around 11 p.m. when he falls asleep. She usually gets her homework done around 3 a.m., which means she must consume at least three cups of coffee the following day. Not only will getting Kairese enrolled in the center save Hembrador money, it will also allow her to spend more time with him.